In modern football, pre-season is a bit like a first date – if it seems to go well, your mind races ahead to all the possibilities that could develop, and there are more reasons that are prevalent as to why it could work, and why it will succeed. But if it bombs, or goes less than planned, most will play it down, talk about the fact that “you can’t make a judgment on one date” and it may take time to get things right – ultimately a rationale to avoid reading too much into a “poor” start affecting future prospects. In SL Benfica’s case, the pre-season campaign has produced the latter. There are mixed feelings amongst many Benfiquistas – some of us are nauseatingly optimistic, convinced that ultimately the results and performances are irrelevant, because the campaign is all about preparing the squad’s various members to reach the required fitness levels. Others (like myself) can’t help but over-analyse the pre-season matches to provide a window to the season ahead, because especially after the heartache that was season 2012-13, many Benfica fans are desperately trying to find some obvious signals that the club won’t be making the same mistakes in the new season. On the face of it, the results aren’t too bad. Excluding the Taça de Honra games, the team’s record was 5 wins, 2 draws and 2 defeats in 9 matches. 22 goals in 9 games is a healthy return, especially given the investments in the squad’s attacking resources. But 15 goals conceded with no clean sheets for a team that invested in 3 new centre backs, 2 new fullbacks doesn’t sound healthy. For the sake of balance, let’s start with the positives, because they certainly were there. Benfica’s transfer activity in the summer was decisive and plentiful, with a large number of signings coming in early. Given the nature of the signings, it’s clear the Eagles expected pressure in being able to keep certain key players at CB (Garay), and on the wings (Gaitan, Salvio). It’s commendable that the club made a positive effort in dealing with the squad depth, which is certainly in much better health than last season. Some of the new players looked impressive in pre-season fixtures too, only adding to the confidence. Steven Vitòria looked solid in most games, and illustrated some of the experience he already has in Liga football (having played with Estoril for 3 years). The Argentine Lisandro Lopez looks reasonably quick and already has a goal to back up his uncanny knack for meeting opportunities at set-pieces. While Sulejmani seemed to lack the fitness at times befitting of a wing forward role in the team, his technical ability looked special. He showed a great ability to anticipate and follow up crosses toward the far post very well. His footwork may not be of the same level as Salvio, but it’s not far off. The Serbian winger is a typical Jorge Jesus type signing in that he has solid attacking instincts and great individual technique. But without doubt, the main impressions created in pre-season came from Lazar Markovic and Filip Djuricic, both of whom contributed significantly, with the former scoring 4 goals and the latter creating 3 in the matches they played. Markovic showed silky individual skills and the ability to create opportunities all on his own with little reliance on things around him. The maestro has already been likened to the legend João Vieira Pinto (not least of which because of a similar build, appearance and playing style). 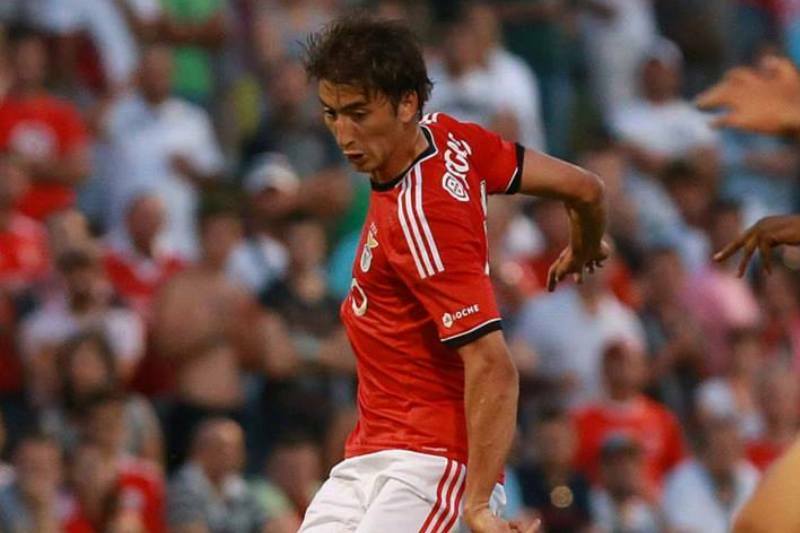 Markovic was the most expensive transfer for Benfica this transfer window and he’s shown enough already to suggest the money was well invested in a player who could already contribute substantially despite his current age (19). Djuricic meanwhile has also drawn comparisons to another club legend, namely Rui Manuel Costa. The comparisons are justified in the sense that the Serbian plays a similar role to the Portuguese Benfica fan favourite. Djuricic seems the more like-for-like replacement of Pablo Aimar’s role in the team (a position I hoped would be filled in previous Benfica blogs). There were other positives too from the current squad. Lima’s excellent form continued as he scored 6 goals, Salvio set up 4 goals across the matches he played in, and there were solid cameos from Matic, Amorim and Rodrigo, amongst others. And while the end of the transfer window is still not upon us, the fact that Benfica still have the squad intact with the presence of Garay, Gaitàn and Salvio is highly encouraging from the perspective of retaining their quality and experience. There’s no doubt that the team’s ability to accumulate the 22 goals it did in pre-season is a testament to the ability of Benfica’s attacking strengths to penetrate defences. The best defence is a strong attack… or is it? Now while those positives are obvious and certainly commendable, there are concerns, that if unchecked, could become not only significant, but ultimately crippling to a title challenges. The biggest issue – hands down – is that the team's inherent weaknesses from last season don’t seem to have been addressed. And if that the case despite making signings in those positions, then either Benfica bought poorly, or Jorge Jesus’ tactical setup isn’t working as it should. I perceive the issue as an unhealthy mixture of both. This is embodied perfectly in the signings at fullback. Bruno Cortez’s nationality, appearance and attacking demeanor threatens to remind one of Real Madrid’s left back Marcelo… until you discover his touches aren’t as clean, and his positional sense is terrible. Many an occasion in pre-season, he displayed an inability to track back when pushing up too far and allowing his colleagues to be exposed at the back. But that’s not just a function of his poor tactical discipline, it’s also due to Jorge Jesus’ insistence to play an entertaining, but somewhat reckless and dangerous style. Typically when teams use fullbacks to offer width, wingers will “invert” and come inside, while central midfielders are supposed to drop back to assist central defenders to prevent the counter. Benfica aren’t very good at this exact quality, especially against sides with pace, or half decent tactical application. The likes of Cortez and Silvio therefore, as new additions to the squad, haven’t displayed anything – yet – that gives comfort to the need for an improvement at left back. Instead, the two signings offer as much doubt as there was with last season’s converted left back, Melgarejo. Another concern defensively is that of goalkeeper Artur, whose form is questionable. However, Benfica’s mismanagement of the situation regarding talented youngster Jan Oblak effectively has reduced the Brazilian’s competition to veteran Paulo Lopes, and rookie Mika, both of whom aren’t good enough to challenge Artur for a first team place. The lack of proper cover could be a issue, if Artur doesn’t cease to bring nerves in Benfica’s backline. Jorge Jesus also seems relatively insure of his favoured lineup, or favoured system. Benfica’s use of a loose 4-4-2 formation, especially against Napoli was ineffective and did little to hide the soft centre in Benfica midfield. This isn’t, of course, due to any lack in quality of Matic and Enzo, but rather again comes down to Jesus’ preference that the two of them push forward considerably, leaving the centre backs exposed. It also isn’t clear who Jesus prefers at left back, or in the central attacking midfield position (Djuricic or Markovic). One of the other controversial issues is that of the absence of Cardozo. His potential exit leaves the team short of a player who lacks mobility, but not for technique, height, power and a consistency that the inexperience of Markovic or Rodrigo cannot replace. Benfica’s style suits Lima, but ironically, 4-4-2 works better with Cardozo as the 2nd striker as opposed to Lima and Rodrigo, for example. After Cardozo’s apology, it’s unclear if Benfica plan to even use him, but assuming they don’t, or that he departs in some form in the remaining days of the transfer window, the Eagles will certainly need to refine their approach and use of the current attacking options. Goals from the inverted wingers need to become more extensive (which makes Salvio’s form in pre-season extremely encouraging), and the creative talents of Djuricic and Markovic will be especially important in leveraging the movement of Lima and Rodrigo. Of course, in a sense, all these criticisms can ultimately be irrelevant observations that don’t speak anything over the team’s chances in the league. There’s no real correlation between a relatively good / bad pre-season and a relatively good / bad season. And in the case of Benfica, there still remains the divided opinion with respect to Jorge Jesus, and those opposed to him will likely be as cynical as I’ve been, if not worse. Nonetheless, there are some key learnings from pre-season, made all the more complicated to assess since, out of all Benfica’s opponents (with respect), only Bordeaux and Napoli were remotely of a strength comparable to the level that Benfica should ideally be testing themselves against. Benfica have still got considerable issues in balance. While the effort to sign players to cover for weaknesses was certainly there, some of those players haven’t yet inspired confidence. The team still looks likely to leak goals from tactical application of over-zealous attack, rather than developing the ability to get a 1-0 lead and control the game to a winning conclusion. But there are considered positives as well. The signings of Djuricic and Markovic, and the return of Amorim, gives the team the ability to use different tactical setups, and different variations of formations, which could come in handy. The depth of the team is extremely healthy in most cases. And even though Jorge Jesus loves to play high risk, high reward reckless attacking football, luckily in the Liga, there are arguably only 3-4 teams that really could cause Benfica problems, and Benfica have enough talent to get away with their chosen strategy to beat most of them. Benfica faces the unusual situation of having all the pressure on them even though they aren’t defending the title. The club’s reputation, the fallout of the near-treble success last season, the number of transfers and the changes in manager at Porto, Braga and Sporting effectively means that the Eagles are logically perceived as the team most well positioned to take the title. Time will tell if Jorge Jesus’ team duly obliges. Because if next season is as close as last season’s title race, it is quite obvious which match in the Liga calendar is most likely to decide the title. Hopefully by then, pre-season’s a long distant memory, and Benfica enter the Dragão better balanced and prepared to beat Porto... and finally earn another Liga victory for Jorge Jesus. Bring on the new season. Força Benfica.